Hey everyone, While I'm sure everyone has seen or used the new Warrior Stick Customizer, there is a problem. The Junior has only three curves to choose from, the W03, W28, and W88. I would love to see more diverse curve selection, because not everyone can flex an Intermediate or Senior, or doesn't like the W03. Why aren't there any more Junior curves, and could Warrior add them? True XC9 gloves vs. Warrior QRL Pro? I'm looking to update my gloves (currently in Easton HSX Synergy), and I'd like to try another brand this time around. I love the anatomical fit of my current gloves, which I found better for me than Bauer's equivalent 1s and also found the 1x to be too loose. I've read good things about both the True XC9 and the Warrior QRL Pros, which especially get a lot of love around here. My problem is that I haven't found anywhere locally yet that have the Trues in stock to try on. The quality seems to be roughly equal for both, but my main concern is surrounding fit between the two. Has anyone had experience with both and can speak to which provides the snugger fit throughout? I'm not as concerned about the Z-palm technology in the Trues and value fit above all else. All 14” used, all prices shipped within US, +$15 to CAN Overseas Covert DT1s Backlund Flames no overlay on palms $80 Rangers team stock, micronash with overlay $80 SOLD Sharks team stock, tear in right palm but had digital palms and white mesh gussets from Pat $40 Will throw in Sharks for free if you take all 3. I recently picked up a pair of Warrior HD Pro shin guards and I have a question about the Pro tier that Warrior offers. When checking the catalogue for the HD's year it was mentioned that the Pro protective is what's offered to teams, and along with that PSH sells them too. Does that mean that the Pro line is just a less bulky version, but elite piece of equipment such as reebok 7k vs 8k (or 19k, 20k and 21k .... I think) or just a way to avoid using a 2? Reading up on them and their other lines just had me wondering and I'm aware that these aren't pro stock either. Warrior Pro pants Med+1 and Med Tall size difference? Warrior VIP Program First and foremost I would like to thank everyone at Warrior Hockey, especially those involved with the program. I am truly grateful and honored to be part of such a highly-coveted team. Warrior has really broke the mold once again and developed a very special program. A program that illustrates how important it is to them to recognize the individuals who support them day in and day out, both on and off the ice. Membership selections are made without social popularity or skill-level bias; Warrior sincerely cares about all of their customers. In addition to creating an environment of open communication, shared experiences, and a generous reward system, Warrior continually illustrates transparency, respect for the feedback in which they receive, and engages with their VIPs on a personal-level. As if that wasn't enough, I have been lucky to make connections with many people who, without the avenues created by this program, I would never have met. So THANKS again to Warrior Hockey and my fellow VIPs; this is such a special group and something that I do not take for granted. I hope that I can continue my membership in this program, and do my part to return the favor, to a company that has delivered value to me and my teammates throughout the years. And with that, let's get to the actual review! The Warrior Alpha QX is a completely new stick lineup and thus has been engineered from the ground-up. There was much time spent on research and development of the QX and it revolves around five focal points of technology: Sabre Taper, True 1 Phantom Feel, Minimus Carbon, Ergo Shaft Shape, and Protex Performance Grip. I have been using the stick heavily for over a month now and want to provide my insight on the tech and my experiences with the Alpha QX. Sabre Taper The primary focus of Warrior's patented taper design is to maintain stability throughout the blade when releasing your shot. In my experience with many competitor sticks, when loading up to take a shot, the blade tends to open up a bit. Although this may not seem like that big of an issue, compromise at such critical point in your release, greatly hampers the speed and accuracy of your shot. You can tell that Warrior really researched and honed in on the shaft and hosel technology in the Alpha QX. The mid-low flex point of the stick definitely allows you to snap-off your release much quicker while maintaining your accuracy. In my opinion, the ability to release a quick and accurate shot is crucial, as many times it prevents the goaltender from being able to establish his position. I personally noticed a huge difference in both snapshots and slapshots. The "pop" was exceptional as the puck jumps off the blade and follows your line of sight. Warrior really hit the target with the Sabre Taper; it's not a gimmick, it's legit. True 1 Phantom Feel The Alpha QX is extremely light and well-balanced. There are some other sticks on the market that are also very light, but finding the right balance is an artform. The Alpha QX is approximately 410 grams (senior model), but when holding it in your hands, it actually feels a bit lighter. That perception is a product of Warrior's focus on the balance of the stick, specifically towards the hosel and blade. A well-balanced stick really enhances puck-feel and this is an area that is extremely important to my game. With the Alpha QX, whether I'm skating through the neutral zone, making hard pivots, or deking, I never feel the need to look down at the puck. The stick is also very receptive at receiving hard, crisp passes. I have experienced a wide variety of blades in my time, ranging from too soft, to too "pingy", but the Alpha QX has a very natural feel combined with exceptional blade durability. Minimus Carbon Strength and durability is something that Warrior has continued to work on over the years and they have really developed a strong carbon-weave technology that greatly improves the overall strength of the stick without compromising weight. As I mentioned above, I have been using this stick heavily for a while now and it has taken quite a beating, especially through the playoff rounds. In addition to the shaft, since I am a center, the blade has also been put through the ringer. I can honestly say that through all the slashes, hacks, etc. that the stick's integrity has not been compromised at all; it plays the same today as it did on day one and that speaks volumes. We all know that sticks today are very expensive and there's nothing more frustrating than having your stick break shortly after purchasing it. My Alpha QX may show cosmestic blemishes, but the structural integrity is solid and I feel confident that this stick will last a while. Ergo Shaft Shape The shaft of the Alpha QX mimics that of a dog bone with it's slightly-concave side walls. Personally I am not a fan of the traditional box shaft shapes, so this works really well for me. I find it very comfortable to hold and provides a natural feel. Shaft shape is another area that may seem insignificant, but for me, it's important for a stick to feel like an extension of my arms. The dog bone shaft was quite a nice treat for me! Protex Performance Grip Complimenting the ergo shaft shape, I really love the textured corners that the Protex Performance Grip provides. It's that tactile feel that gives you the comfort and secure grip needed to have confidence when stickhandling and preparing to release your shot. These finer details really go a long way in adding to the stick's overall performance on the ice. OVERALL I would highly recommend the Alpha QX stick, it's a stick that performs as advertised and holds up to the punishment of the game. There a models for each level of play, so be sure to check out the full stick lineup. Speed, accuracy, comfort, and stability - Warrior really provides the foundation needed to help your game! I'm looking to get a new pair of gloves. Looking at either warrior pro stock qr1 or main line qrl3. I'm assuming the qr1's will have a softer palm but will they wear quicker than the qrl3 palms? I don't need top of the line but if they are in the same price range then durability is the only question. Any help would be greatly appreciated. I'm sure everyone has seen the Crosby slash on Methot and the finger injury. I was watching a sports show and the topic of glove protection came up. One of the hosts mentioned that NHL players have been complaining about the lack of finger protection with one brand, but declined to say which one. Does anyone know what brand it is? Definitely not the best marketing for Warrior coming away with a severed finger. For the past month, Warrior has been posting sneak peeks of their new Covert stick line, which is the latest revision to the Dagger Taper sticks; now that every stick has been unveiled, we will now have a thread dedicated to the stick line. 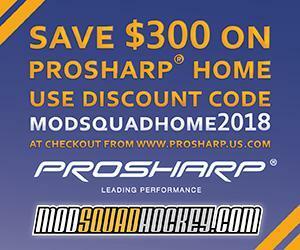 The catalogue is here; complete with all of the sticks in the lineup - http://www.modsquadh...neup-catalogue/ Also, Keith Perera, who is the Stick Product Manager at Warrior (and posts under miseaujeu here) will be active in this thread, monitoring as well as answering any questions you all may have. I will update this thread as time goes along. Once again thank you to ThinkingJack and Warrior for making me a #WarriorVIP and hooking me up with this stick. I am extremely grateful and appreciate it. I've had a few people ask me about this stick so far and I feel it would be better for me to just make a quick write up about it rather than have to say the same thing over and over again. I have used the stick about 5 times so far on the ice (my league is unfortunately taking a 2 week break or else that number would be higher) and have used it on my outdoor shooting pad. Since I haven't used it enough to talk about the durability of the stick this will not be a full blown review but rather more of an initial impressions and initial performance review and because of that I will not add scores to anything but Warrior Covert QRL 100 Flex W03 Backstrom Stick History: Sherwood 9950 Wood Coffey, Bauer Supreme (Sport Chek SMU) Kane, Sherwood T70 Stastny, Winwell GX8, Easton RS Parise, Warrior AK27 , Warrior DT1LT Pavelski, Warrior DT1ST Grandlund, Verbero PM44, Sherwood Rekker EK60 PP26, Warrior Covert QRL W03 Stick Info: Height: uncut Weight: 409 Grams Grip: Yes Shaft: Gloss Length: 60 inches Usage: 5 Skates Grip: I am not a huge fan of grip sticks and most of the time prefer the non-grip and matte versions to them. With this stick I didn't have a choice in grip vs non-grip and had to go with the grip stick. I was really hoping the grip was going to be similar to my Warrior AK27 and be the velvet style, but it is more of a tacky style of grip. It does have CorTex Grip which is raised edges along the sides of the shaft which I really like. The bottom of the stick has the matte finish closer to the blade and I know I would enjoy using that style of shaft more so than this gripped version... with that said the grip certainly doesn't take away from my enjoyment of the stick and I enjoy the grip used here more than the one on CCM and Bauer sticks that I have tried before. Aesthetics: Warrior has talent when it comes to design good looking sticks that are instantly noticeable and ones you can follow the lines of lineage (Bauer Supreme does a good job at this too). I have a soft spot for orange (one reason I really liked the Sherwood EK60 design) and baby blue and Warrior does an awesome job in using those colours as accents to the black base of this stick. I really like how the bottom of the shaft is orange near the blade and I like how they use the colours to form a background of the word marks (notice how QRL and Warrior are in black with the colours surrounding them instead of just using the colours on the black stick base). I also love exposed carbon fibre weave that is on the blade and up the hosel, I personally wish this traveled all the way up the entire stick since I love that look so much. I understand why they didn't as it would make the black word marks too busy with exposed carbon fibre and the intricate designs around them. This stick looks great from any angle and is immediately noticeable that it is a Warrior Covert. Blade/Curve: Just like the grip I did not have many choices when deciding on the curve options. I choose the W03 since it was the only one available in the shaft flex I wanted. I normally prefer heel curves like the W05 Grandlund as they fit my style of play and are great for passing (which I do before shooting). With that said because of my time with the Ek60 I have gotten more used to curves that are more aggressive and I am so far getting along with this stick pretty well. 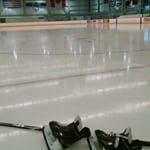 The first time on the ice I had some hard passes get too much air but I have since adjusted to it. The blade itself is really nice and is very stiff which is great for puck feel and play-ability. The stiffness of the blade has a pingy and lively feel and is really noticeable when receiving a hard pass and stick handling, you always know where the blade is and where the puck is on it and I believe the stiff nature of the blade provides excellent feedback. Stick Handling: With the lightweight and lively blade stick handling with this stick has been very good. Unlike some lightweight sticks in the past I never "lose" the blade of this stick and always know where it is. The stiff blade gives me confidence when handling the puck since it gives great feedback to how the puck is actually behaving on the stick itself. The excellent balance helps the stick feel like a natural extension to your hands and never feels unwieldy. Shooting: This is the shinning point of the Warrior Covert QRL. I cannot recall a time when I felt pucks fly off of my stick as hard and as consistent as they do with this stick. Using it reminds me of the first time I used my DT1LT, except these feel even harder. With minimal effort my shots come off my stick hard with a satisfying and strong kick. I truly feel this stick is making me a better hockey player as I no longer have to worry about the mechanics of my shot to ensure I really release a rocket. I spent time on my shooting board with this and my beloved EK60 and I could really notice the difference in average shots where it felt like the Warrior Covert QRL really did most of the work for me. Out of 10 shots I felt that 9 of them left me completely satisfied without the feeling that I could get more on them, but with my EK60 only a couple out of 10 I was completely satisfied on how the puck came off the blade and ended up. To me the Warrior feels like it never leaves anything on the table and doesn't require you to make a perfect shot, it just kicks hard and launches the puck in a very satisfying manner. Slapshots feel almost dangerous with this stick for how hard they were launching to the point where I wasn't comfortable in taking them on my shooting board to ensure an errant puck off a post wouldn't damage any fences or property. 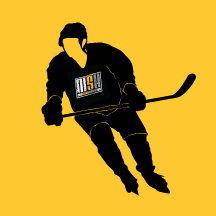 Passing: I am not sure if it was the kick of the stick or the curve which was giving me some issues the 1st time I was on the ice, but a lot of my stretch passes ended up far too high for my target. I have since adjusted my passing a bit and haven't really had any issues since. While the blade isn't my idea curve for saucer passes and passing in general I am not having a difficult time passing over players sticks or cross-ice. Backhand passes will need work because of the aggressive curve but that is something I will just practice and get used to. Durability: So far everything is holding up great and the stick still feels brand new. But with its limited usage I cannot fully comment on this category yet. Feel: I mentioned the excellent and stiff blade earlier already. The balance of the stick is fantastic and it does a good job of being lightweight but still being noticeable. I never feel like the stick doesn't have a blade and always feel in total control of the stick. The lack of weight also helps with making the stick extremely mobile in terms of movement, you never feel bogged down when moving your hands or attempting to move the stick (something I feel time to time when using much heavier goalie sticks). While this stick is slightly heavier than the Sherwood EK60 I really don't notice the difference between the 2 in terms of weight. Closing: If the durability in terms of blade stiffness and shooting kick hold up this will easily be my favourite stick I have ever used. I am unbelievably happy with is so far and am really grateful Warrior and ThinkingJack having given me the opportunity to use it because I really can't get enough of it so far. The Warrior Covert QRL as it stands is the best stick I have used in terms of performance and balance, shots kick off the blade harder than anything I've used and the stiff blade is wonderful for puck control and feel. I absolutely love the carbon wrap visible in the blade. Stick comes in at a respectable 409 grams. Not the lightest stick I have used but it feels wonderfully balanced and I never notice the extra grams compared to the lighter ones. I am a big fan of the graphic package as well. I've been searching and searching for a cheap Warrior stick to try, and I had settled on the Lupul pattern because it is the most similar to the PM9 Stamkos/Malkin Bauer pattern, which is what I've been using for years. Yesterday I went shopping and one of the sales reps pointed me to the Granlund pattern, saying that it was actually a little straighter and sounded like it would suit my Lie needs as well because I skate more upright. Does anyone have any experience using these two blades? Anyone smarter out there than me that can confirm whether or not the Granlund pattern has replaced the Lupul? Thanks as always. Sticks for 40$ or less - which to buy? Hello everyone, I've been needing to go back down to Junior sticks for a while, but I haven't gotten around to buying one since my season ended about a month ago and I haven't played since. However, I've been looking at HM for cheap sticks, and they gave me a $20 discount code, I could grab the Warrior QRL5 or the True A1.0 SBP for 40$ free shipping, or the Sherwood T90 for 9$ and 6$ shipping. If anyone has used any of these sticks, which would you recommend the most? I don't really notice the difference between low and mid kick sticks, so I'm open to buying any of them. Thanks. Warrior QRL1 vs QRL 2 vs QRL 3 vs etc. I was looking at the Warrior QRL line and was wondering if anyone knows what the differences between each of the sticks is. I've been googling like crazy, but all I can find is they use different versions of the Minimus Carbon like Minimus 1000 for the QRL 1 and Minimus 600 for the QRL 3. But I was wondering what gets added to the stick as you move up the price points from QRL 5 to QRL 1? Do the blades get stiffer from more reinforcement or do they all use the same blades? Is there a difference in the hosels? Stuff like that. I was also wondering about the source for sports exclusive QRL Krypto and Krypto Pro. Or am I overthinking things and it's just simply different Minimus Carbon and that's it? TH has the new Warrior Dynasty girdle available for pre-order. I currently use and love the Projekt girdle. I really like projekt's built in "cup holder". Anyone know if the new Dynasty girdle has this feature? I assume no because there is no mention of it on TH's site. I also wish Warrior would've added velcro to attach socks. Trying to decide whether to wait for the Dynasty or buy another projekt now that they are on clearance. Been searching for a Warrior Projekt Mid Body Girdle in an XL but cannot find one anywhere. Can any one help me?